Hailing from Kenya, Matata (formerly known as Air Fiesta) arrived on the London scene in the early 70s having received the accolade of “Best Band in Africa” from the BBC World Service. 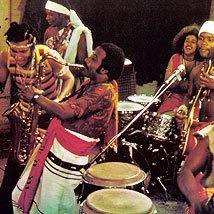 Their recordings exhibited a range of styles – jazz, soul and the genre with which they are most commonly associated, funk – and also a range of languages, with songs in Mijikenda, Lingala and Swahili as well as English, all with an Afrobeat edge that made their sound unique. President Records owns the master rights to the entire Matata discography, which consists of the tracks on the albums Air Fiesta (1972) and Independence (1974). Recent times have seen a revival in interest in the music of the Africa of the 1960s and 1970s and, though the band never achieved a chart placing, songs such as I Feel Funky, Wanna Do My Thing and Talkin’ Talkin’ are remembered with much fondness. The album Independence is also notable for the guest appearances of some of the great African instrumentalists of the time, including Dudu Pukwana and Mongezi Feza. To make these unique recordings available to a new generation of listeners, President Records remastered the entire Matata catalogue in 1994 and released it on CD in two collections: Wild River and Feelin’ Funky.